When originally conceived, the efforts of Food Solutions New England (FSNE) were centered on discovering the potential and possibility of working together as a six-state entity. Our first New England summit was convened in 2011. We considered the benefits of working together regionally, explored the possibilities of promoting greater food justice, and embraced the merits of expanding food production via the concept of a New England Food Vision. By 2012 we had adopted the collective impact model as a way to organize our work. 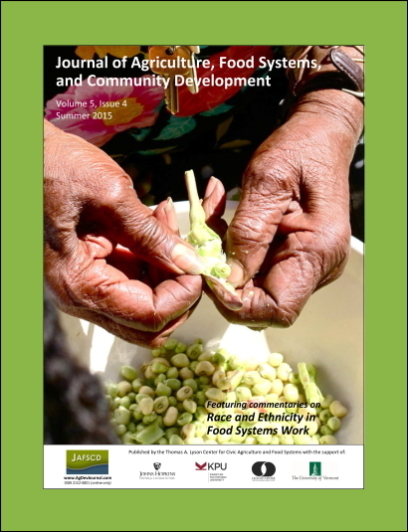 In 2013, during this first year of breakout sessions we identified "racial equity and food justice" as non-negotiable, explicit attributes that should inform all food system work. We continue to learn and demonstrate a commitment to promoting greater racial equity and food justice through a variety of network and community strategies. Select examples from FSNE's efforts are provided as evidence of the power of collective impact and regional collaboration. As states and regions come together to challenge the status quo, share strategies, and align policies and practices designed to address food system inequities, we are emboldened, knowing that our collective commitment and actions will have implications that extend well beyond the food system. Thomas W. Haas Professor of Sustainable Food Systems, University of New Hampshire (UNH) Sustainability Institute; 129 Main Kendall Hall, Kendall Hall; Durham, New Hampshire 03824 USA; +1-603-862-1456. Burke is also co-chair of Food Solutions New England, Racial Equity and Food Justice Working Group; and director of the UNH Dietetic Internship in the UNH Nutrition Program. KAS Consulting, Principal and University of New Hampshire, Sustainability Institute, Co-chair of Food Solutions New England, Racial Equity and Food Justice Working Group. She can be contacted at KAS Consulting; P.O. Box 52476; Boston, Massachusetts 02205 USA.